Megafaun: Classic Rock, Made New Megafaun's "Get Right" is a sprawling eight-minute psychedelic drone, punctuated with dazzling electric-guitar fuzz. Megafaun's "Get Right" is a sprawling eight-minute psychedelic drone, punctuated with dazzling electric-guitar fuzz. "It's long overdue," Megafaun's Brad Cook croons in "Get Right," adding, "I thought it would die but it grew." That line could very well describe the history of this North Carolina experimental rock band. The trio, whose members once worked with Bon Iver's Justin Vernon, has undergone significant personnel changes since forming in 2006. 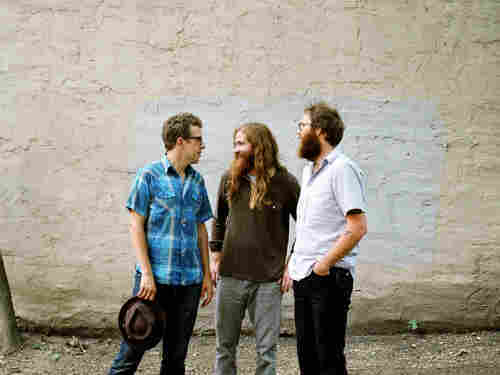 But with its excellent self-titled third record, Megafaun has finally come into its own. The key track on Megafaun, "Get Right" is a sprawling eight-minute psychedelic drone, punctuated with dazzling electric-guitar fuzz, rumbling toms and strummy acoustic guitars. Cook, along with his bandmate brother Phillip, grew up listening to The Grateful Dead, and that group's knack for free-form improvisation rings through, particularly in the spidery, Jerry Garcia-style guitar melodies. But Megafaun is far more than a bunch of Deadhead copycats. The song's easygoing groove --­ pockmarked with digital blips and loops --­ proves that Megafaun's members are journeymen for the 21st century, perfectly adept at exploring stunning new sounds with or without the help of a certain singer. This story was originally published on Sept. 8, 2011.